Full 720p HD with NO ADS! Plug and Play - Stream in Seconds! Easy Is An Understatement! Plug it into your internet and camera, and voila! Sharefaith Streaming is only $99/m. You can choose to pay annually or monthly. If you pay monthly, you also need to pay a one-time fee of $200 for the BoxCast device with your first month. From then on, it's only $99/m. Annual members get the box included in their membership. You can go free with Facebook or YouTube, but you'll suffer the poor quality, lack of support, and lack of custom branding. With other streaming providers at this price, you'll give up custom branding, have ads display during your stream, sacrifice storage, viewership and support! Not with BoxCast! It's a great choice! Live video streaming enables a church to engage existing members and spread its ministry to more people. Research has shown that live-streamed events have four times longer viewership than recorded events. So, if you really want to reach out and grab your audience, live streaming is the way to go. 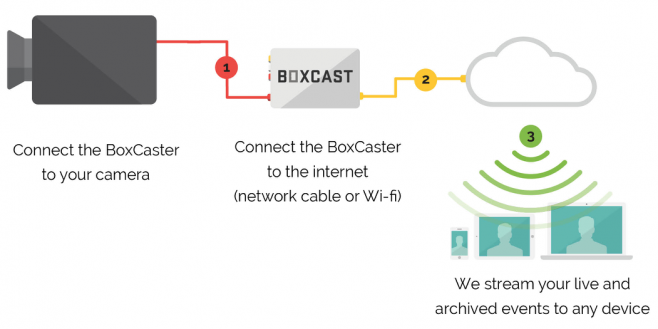 What Do Churches Say About BoxCast? 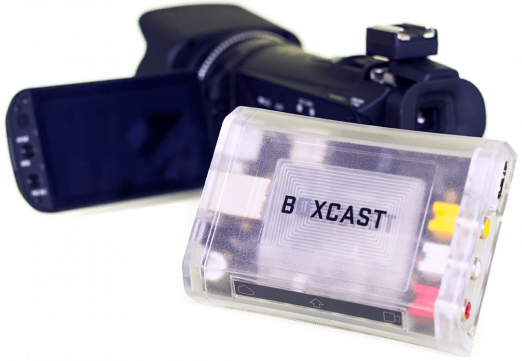 Because BoxCast is a smarter way to stream, no other company makes HD-quality live streaming easier, more reliable, or more affordable for churches. All you need is a video source, internet connection, and our BoxCaster - and you’re good to go. Because of our patent-pending technology, your viewers get a buffering-free experience regardless of the number of viewers. What Internet Connection Speed Do I Need To Stream? Set Up and Start Streaming? We can have you broadcasting in just a few minutes. Simply plug in the BoxCaster, configure your stream settings (or just stick to our defaults) on your dashboard from any device, cut and paste the embedded code on your website, and you’re ready to stream! What Is Included In My Church Streaming Package? Scheduling is as easy as entering an event title and start time and then clicking ‘schedule’. Your church service or event can last anywhere from a few minutes to all-day. BoxCast handles it all! Yes. Missed events can easily be watched using the same link generated for the live event! You can manage multiple events from one BoxCast account. You’ll just need additional BoxCasters. Thousands of people can view your broadcast, in HD, with no ads. Unlimited streaming! BoxCast's amazing team is ready and excited to help you get up and running in no-time! Click the button and complete the online form. A BoxCast agent is ready to assist you! LET THE LIVE STREAMING BEGIN!